cinegearpro has no other items for sale. 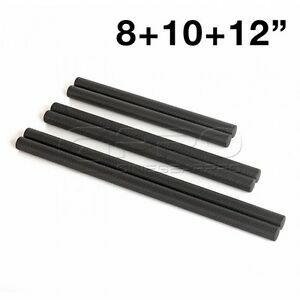 Details about 3 Pair LanParte High Strength Carbon Fibre Rods 4 15mm Rail System Rig 8+10+12"
3 Pair LanParte High Strength Carbon Fibre Rods 4 15mm Rail System Rig 8+10+12"
LanParte 8" 10" 12" High Strength 15mm Carbon Fibre Rods Set. 1Pair(2Pcs) x CGPro 8”/200mm High Strength Carbon Fibre Rods. 1Pair(2Pcs) x CGPro 10”/250mm High Strength Carbon Fibre Rods. 1Pair(2Pcs) x CGPro 12”/300mm High Strength Carbon Fibre Rods.